"In accordance with University Policy, we write to request authorization to purchase fifteen 12 gauge shotguns." So began one of my favorite documents at UT-Austin, arming the janitorial staff (physical plant, as they are called) with blanks to scare of the invasive Quiscalus quiscula, better known as the grackle. In 2005, I wrote a feature about UT's war on grackles (link is a PDF -- an online version is here) based on a number of documents I requested from UT's vice president for business affairs. 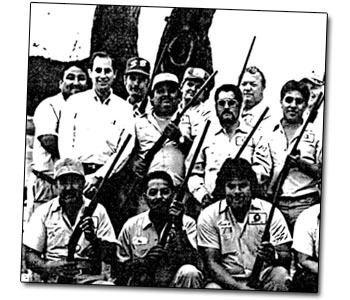 Below are the documents, including photographs of the armed custodians (at right). Some student names have been withheld to comply with federal privacy law. As early as 1986 people on campus began to get increasingly annoyed with the grackles and their "unsightly mess of the walkways, trees and sidewalks." These are some of the more choice complaints directed at UT administrators. High-ranking administrators begin trading tounge-in-cheek memos in 1987, including a suggestion from Liberal Arts Dean Robert King to sell grackle hunting permits. Proof that bureaucracy can still be entertaining. Some on campus begin writing administrators with their own proposals to combat the birds, including (serious) suggestions to pump carbon dioxide under the grackles' nests, putting plastic tarps over campus trees, and spraying purified water at the birds. These files from UT's Physical Plant, which was tasked with resolving the grackle problem, includes research into adverse health consequences of the grackles, a list of methods used to combat the birds, receipts for expenses to combat the grackle invasion, a choice photo of an armed custodial staff, and appreciative letters from the campus community. Of course, not everyone approved of the solution. In 1994, a botany graduate student was unnerved by the shootings and sent in this letter, followed by an internal reply. The University maintains several news clips about the grackles from campus and other publications. Finally, a PDF of a feature I wrote based on these documents in a 2005 issue of The Daily Texan.